aMD, Master in Immunology. Genetics and Molecular Biology, School of Medicine. University of Cartagena. Cartagena, Colombia. bPediatrics Resident, National University of Colombia. Bogotá D.C.
dER Physician, Pediatrics Emergency Unit. 100th Street Medical Complex. Bogotá D.C. Although infrequent, bowel interposition between diaphragm and liver, Chilaiditi’s sign or syndrome (without or with gastrointestinal symptoms), are a major clinical condition given the possibilities of differential diagnosis, such as pneumoperitoneum, diaphragmatic hernia and subphrenic abscess. Objective: To report the cases of two preschool patients with Chilaiditi´s sign and syndrome, as well as to highlight the importance of this clinical condition. Clinical cases: Case 1: A male preschooler evaluated by respiratory disease without abdominal symptoms. Thorax X-ray shows left retrocardiac infiltrates and air in right subdiaphragmatic region. Previous radiographies shows the same image. He was diagnosed with Chilaiditi sign associated with pneumonia, antibiotics were used before discharge. 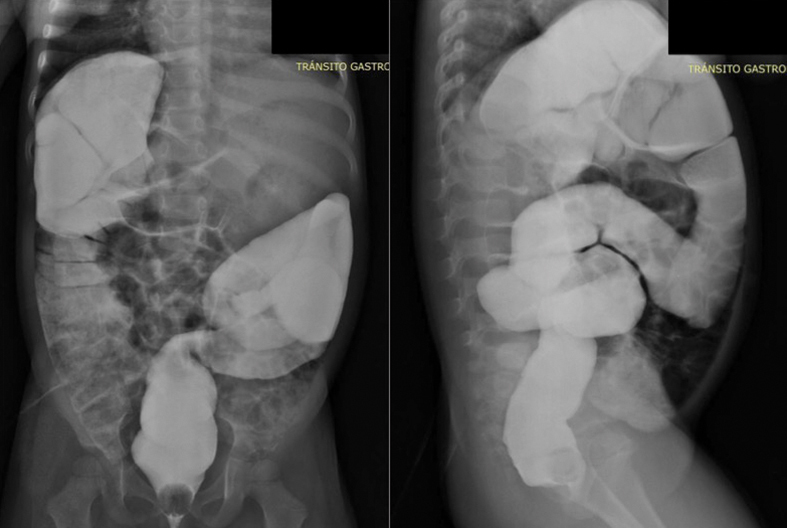 Case 2: A female preschooler, evaluated by abdominal distention and constipation. A previous thorax X-ray shows bowel interposition between diaphragm and liver. Barium enema confirmed the findings. Blood test were normal. A Chilaiditi's syndrome was diagnosed. She received medical treatment with favorable evolution. Conclusion: These cases highlight the importance of this clinical condition that, despite being infrequent, constitutes a diagnostic challenge in the emergency services. The radiological finding of the intestinal interposition between the right hemidiaphragm and the liver is known as Chilaiditi’s Sign in honor to the first report carried out of this condition in 1910 by the Greek radiologist Demetrius Chilaiditi1. When, besides this imaging finding, the patient suffers from gastrointestinal symptoms such as abdominal pain, vomiting, constipation, abdominal distention, and loss of appetite the Chilaiditi’s Syndrome is constituted. This radiological finding is extremely rare. It presents an incidence that ranges from 0.025 to 0.28% in all radiological examinations of the thorax and abdomen, with a preference for persons over the age of 65 and with a higher frequency in men than women3, with men: women ratio of 4:14. Despite this well-described epidemiological behavior, when reviewing the literature, extraordinary case reports of neonatal affectation5 and many others in the pediatric population of different ages4,6 can be found. Consequently, it is necessary that pediatricians have subject knowledge. Three clinical presentations1 have been described for this condition: 1) transverse colon or small intestine interposition in the right anterior subphrenic space; 2) colon or stomach interposition in the right extraperitoneal space; 3) transverse colon interposition in the right posterior subphrenic space. The presence of air will be evident in the subdiaphragmatic space with these forms, this finding has great clinical importance when is accompanied by pain since it doesn’t always imply a surgical emergency7. Therefore, the clinical suspicion and awareness of this pathological condition could prevent unnecessary surgical interventions8. The aim of this article is to present the cases of two preschool patients with Chilaiditi’s Sign and Syndrome and highlight the importance of this clinical condition in relation to the likelihood of confusion and differential diagnosis. 3-year-and-11-months-old male patient, with a history of asthma in outpatient management with montelukast, was taken to the emergency services due to clinical picture of 2 day of evolution, characterized by rhinorrhea and productive, emetizing cough associated with fever up to 102.2 °F (39°C) that did not decrease with antipyretic. He did not have an epidemiological background of contagious or previous migratory movements. The physical examination showed a symmetrical thorax with fine bibasilar rales. The abdominal examination and the rest of the physical examination were within the normal ranges.The laboratory tests evidenced leukocytosis (17,090 c/mm3) with left shift (PMN: 13,940 c/mm3, monocytes 1,300 c/mm3, lymphocytes 1,850 c/mm), and C-reactive protein 117.62 mg/L (cut-off point 12 mg/L). 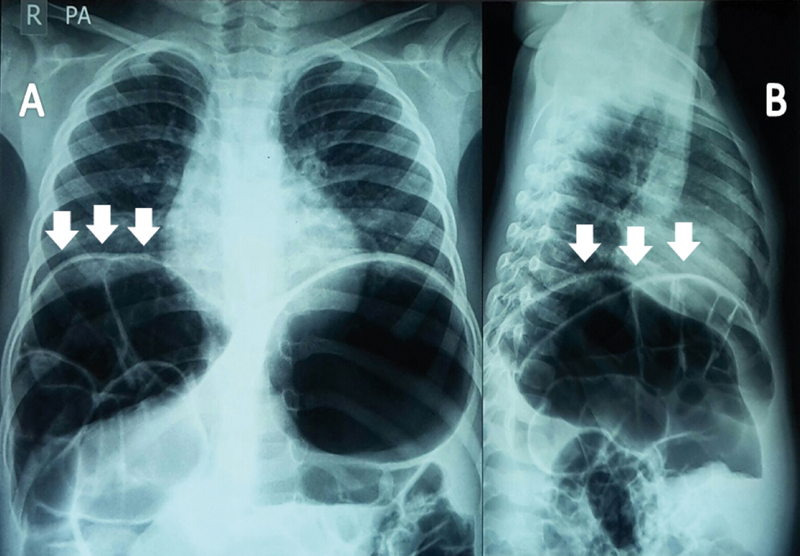 Chest X-ray showed left retrocardiac infiltrates with aerial bronchogram and the presence of air in right subdiaphragmatic region (Figure 1). Figure 1. Case 1’s Chest X-Ray. A) AP thoracic projection, white arrows shows the presence of right subdiaphragmatic air with the haustral pattern. In the black circle, the retrocardiac infiltrates are present. B) Lateral thoracic projection, where with white arrows the interposed intestinal loop is indicated, with black arrows the aerial bronchogram is indicated. The mother was asked again about abdominal symptoms, but she denied them. The patient was diagnosticated with acute pneumopathy antibiotic treatment was prescribed based on amoxicillin at a dose of 90 mg/Kg per day over 8 days. The patient was clinically stable when reassessing two weeks later. For this medical evaluation, the mother provided radiographs from the previous year where the same presence of air in the right subdiaphragmatic region was evident. Hence, after concluding that the patient presented Chilaiditi’s sign, he was discharged. 2-years-and-10-months-old female patient, previously healthy, was referred to Pediatric Gastroenterology due to a clinical picture that started a month before, consisting of rhinorrhea, cough, and respiratory distress. The chest-X ray showed an image of the right colon between the hemidiaphragm and the liver (Figure 2), but not another significant cardiopulmonary finding. At the time of the medical consultation, the mother mentioned the improvements related to the respiratory symptomatology. However, she did manifest that the patient presented abdominal distension associated with hard stool consistency, five times a day. Figure 2. Case 2’s Chest X-Ray. A) Anteroposterior thoracic projection. B) Lateral projection. The intestinal loop interposed, with its respective haustral pattern, is indicated with white arrows. The physical examination highlighted a preschooler in regular general conditions with global abdominal enlargement, tympanic, soft to the palpation, no palpable masses or visceromegaly, in the rest of the physical examination there were no significant findings. In the light of this radiological finding, laboratory test and complementary images were requested. The patient was treated with magnesium hydroxide and non-pharmacological measures (increased water intake and daily fiber) to improve constipation. The patient was reassessed with requested tests. The abdominal ultrasound reported liver and bile ducts without lesions, spleen and kidneys without anomalies, and abundant gas was found in the epigastrium-mesogastrium by the left lobe, pancreas, and great vessels. The barium enema confirmed colonic interposition between the diaphragm and the liver (Figure 3). The tests of thyroid function, transaminase, and baseline glycemia were within normal range. Figure 3. Barium enema of case 2. Where the interposition of the colon between the diaphragm and the liver is evident. Based on the clinical picture and the laboratory tests, it was concluded that the patient presented Chilaiditi’s syndrome. With the correct management, the patient presented an improvement in her bowel habits and abdominal distention. Therefore, the treatment was maintained, and the patient was monitored by Gastroenterology. While is extremely rare, Chilaiditi’s sign is an important imaging finding since the differential diagnosis possibilities such as pneumoperitoneum, diaphragmatic hernia, intestinal pneumatosis, subphrenic abscess, and hydatid cyst3,9. Nevertheless, It can be differentiated from the free intraperitoneal air by identifying colonic haustra and by observing how the image is not affected by the patient’s position changes2. The vast majority of cases, like ours, correspond to incidental findings when doing a radiography for other reasons. In particular, our cases were identified in pediatric patients, despite being a condition that most often affect older adults3,10. This report supports the idea mentioned by Iturralde et al.11, who indicate that only one radiography is sufficient to diagnostic Chilaiditi’s sign or syndrome. In case 2, given the gastrointestinal symptoms manifested by the patient (abdominal distention and constipation), the barium enema examination was requested in order to discard other pathologies, considering existing association of Chilaiditi’s syndrome with other congenital malformations as intestinal level and the importance of discarding a possible differential diagnosis6,7. Despite not having full clarity of its etiology, many factors have been implicated in this entity’s development. The most common cause is the flaccidity and elongation of the intestinal suspensory and hepatic ligaments12. Furthermore, the predisposing factors include hepatic, intestinal, diaphragmatic, and miscellaneous factors2, which are listed in Table 1. It is an entity of rare presentation and affects equally men and women, and its diagnosis increases with the age and the amount of abdominal fat. Congenital and anatomical alterations6 have been mainly seen in children. Most patients with Chilaiditi’s sign are asymptomatic13, as in the case 1. But ocasionally, as in the case 2, they can present nausea, vomiting, abdominal pain, constipation, intermittent intestinal obstruction, chronic abdominal pain, and even acute abdomen cases14 have been reported. In case of presenting any of these symptoms, the term Chilaiditi’s syndrome is used. In general, patients with Chilaiditi’s sign do not require managing13. On the other side, patients with Chilaiditi’s syndrome normally improve with conservative symptomatic management4, noticing that the symptoms have improved with bed rest, hydration, intestinal decompression, laxatives, and at times enemas15. Only some patients will need surgery, those cases with persistent pain or development of complications15-18, within which has been described: intestinal obstruction, perforation, ischemia, and volvulus. In the both presented cases, it was decided an expectant management with good subsequent evolution. The importance of this rare radiological finding lies in a proper diagnostic orientation due to the high complexity pathologies that can be mistaken for Chilaiditi’s sign and syndrome. An inadequate interpretation of the imagining finding can lead to misdiagnosis, which means excessive managing with no benefits to the patients. In this line, the exhaustive evaluation of the images and a correct contextualization with the manifestations are the roadmap to discard differential diagnosis of great severity. 1. Gil Díaz MJ, Murillo Gómez M, Jiménez González P. [Chilaiditi’s sign and syndrome: conditions to be aware of]. Semergen 2011;37(5):267-9. 2. Weng WH, Liu DR, Feng CC, Que RS. 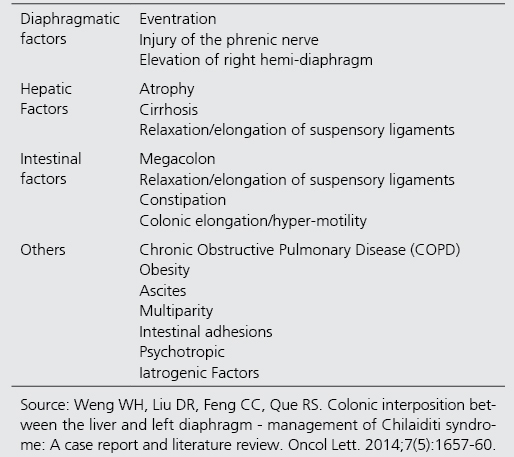 Colonic interposition between the liver and left diaphragm - management of Chilaiditi syndrome: A case report and literature review. Oncol Lett. 2014;7(5):1657-60. 3. Joo YE. Chilaiditi’s sign. Korean J Gastroenterol. 2012;59(3):260-1. 4. Evrengul H, Yuksel S, Orpak S, Ozhan B, Agladioglu K. Chilaiditi Syndrome. 5. Dutt R, Dutt C. Chilaiditi syndrome: a rare manifestation in newborn. J Clin Neonatol. 2013;2(1):50-1. 6. Madrigal Terrazas A, Núñez Giralda A, Rollán Villamarín V, García-Novo MD. [Chilaiditi’s syndrome]. An Esp Pediatr. 2000;52(2):189-90. 7. Chen SY, Chen NF, Lu CS. Chilaiditi syndrome. QJM. 2016;109(9):625-6. 8. Danve A, Kulkarni S. Beware of Chilaiditi sign!! J Community Hosp Intern Med Perspect. 2015;5(5):28622. 9. Corral JE, Sclair S, Moshiree B. Chilaiditi Syndrome. Am J Gastroenterol. 2016;111(1):26. 10. Jackson AD, Hodson CJ. Interposition of the colon between liver and diaphragm (Chilaiditi’s syndrome) in children. Arch Dis Child. 1957;32(162):151-8. 11. Iturralde Orive I, Rocandio Cilvetti B, Canduela Fernandez C. [Chilaiditi syndrome: a single X-ray is diagnostic]. An Pediatr (Barc). 2011;74(1):53-4. 12. Uygungul E, Uygungul D, Ayrik C, Narci H, Bozkurt S, Kose A. Chilaiditi sign: why are clinical findings more important in ED? Am J Emerg Med. 2015;33(5):733 e1-2. 13. Esperto H, Ruivo C, Ferreira E. [Chilaiditi’s sign]. Acta Med Port. 2013;26(1):71. 14. Kang D, Pan AS, López MA, Buicko JL, Lopez-Viego M. Acute abdominal pain secondary to chilaiditi syndrome. Case Rep Surg. 2013;2013:756590. 15. Guerra F, Sacchetti R. Chilaiditi syndrome. An uncommon cause of crampy, upper abdominal pain. Ann Hepatol. 2016;15(5):773-4. 16. Vallee PA. Symptomatic morgagni hernia misdiagnosed as chilaiditi syndrome. West J Emerg Med. 2011;12(1):121-3. 17. Williams A, Cox R, Palaniappan B, Woodward A. Chilaiditi’s syndrome associated with colonic volvulus and intestinal malrotation-A rare case. Int J Surg Case Rep. 2014;5(6):335-8. 18. Moaven O, Hodin RA. Chilaiditi syndrome: a rare entity with important differential diagnoses. Gastroenterol Hepatol (N Y). 2012;8(4):276-8.